Libertarians would seem like natural allies of the preborn. The fundamental principle from which libertarianism is deduced is non-aggression axiom. This axiom is simple: it is never right to commit aggression (violence) against another person, except in the case of self-defense. Common sense would seem to dictate, then, that abortion, the most grievous kind of aggression, would be opposed, but that is not the case for the majority of libertarians. The Libertarian Party platform itself is pro-choice, saying the government has no place intervening between the woman and her womb's occupant. It's a private matter, they say, and a woman has the right to her own body, ignoring the claims of the preborn person to life, liberty and his/her own bodily integrity. Baby Samuel reached out and grabbed the surgeons finger during a crucial in utero surgery. The photographer became a pro-life activist after this.I can still remember my first pro-life rally. I was a pleasantly plump fifth grader with my family on the steps of the Oklahoma City courthouse, holding our Knights of Columbus pro-life signs, showing our support for all human life, separated only by the accident of birth. Because of the Catholic Church's consistent stance against abortion and my family's pro-life commitment (my dad is a sidewalk counselor), I grew up assuming that if you were Christian, you must be anti-abortion. I could not understand how one could reconcile the Sermon on the Mount with abortion, though many of my Protestant friends were mostly against abortion, except for the "hard cases". And this has always bothered me. 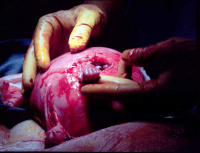 Abortion either is or is not the killing of an innocent human person.